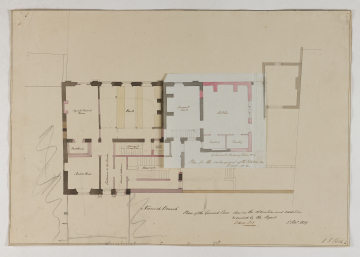 Alterations to the premises, shown in pink wash, include (on drawing 79) the addition of two new staircases in the former hall and kitchen, an agent's room with adjoining book room in the north east corner of the ground floor and, on the one pair floor (drawing 80) a china closet, WC and pantry at the top of the new main staircase. 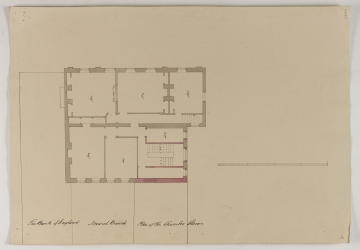 These alterations correspond to those shown on drawing 70. 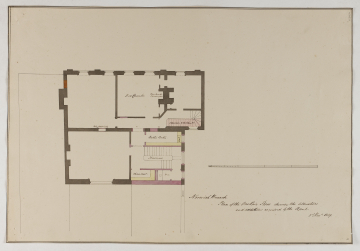 Further alterations correspond to the rough pencil lines on drawings 70-73, and include the enlargement of the back kitchen (drawing 79) and the repositioning of the scullery and pantry (drawing 79, flier), as well as the addition of a new staircase leading from the servants' hall to the one pair floor. 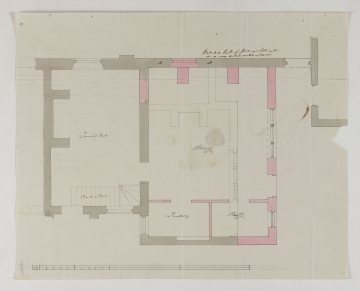 It appears that the flier was added after the receipt of the letter from Thomas Heath (clerk of works), as the design replicates the drawing on the verso of the letter and Heath's description of 'two servants sleeping rooms over'.